LaRouche in 1987: ‘The Woman on Mars’ by Lyndon H. LaRouche, Jr.
Lyndon H. LaRouche, Jr. in his 1988 Presidential campaign video, 'The Woman on Mars'. What I am about to present to you are the highlights of present U.S. plans for establishing a permanent colony on Mars by approximately the year 2027 A.D. The plans to be outlined here are based on the two somewhat similar, but slightly differing versions of the plan as developed by various U.S. specialists. One plan is that first presented at a June 1985 conference in honor of the space pioneer, Krafft Ehricke, who died at the end of 1984. The second plan, is one drafted by the National Commission on Space, and presented approximately a year after the Krafft Ehricke conference. This presentation will emphasize the approach laid out at the Krafft Ehricke memorial conference, but it will also make use of important features of the proposals by the Commission on Space. For this purpose, I ask you to come with me, in your imagination, to a Wednesday in September, in the year 2036 A.D., nine years after the Mars colony has been founded. Starting from an imaginary television broadcast to Earth at 1800 hours London time, that day, let us look from that day and year, back to the time of the United States’ adoption of the Mars colonization project, and trace each major step of the project from the year 1989, up to the year 2027, the year the first permanent colony on Mars is finally established. Those who have worked to prepare this presentation, have thought that we must use our powers of imagination in this way. It is thought, that we must focus attention on our destination as we outline each step of a journey. It seems to us, that that is the only way this project, and its importance for all mankind, can be properly understood. To present the project in this way, it is necessary to include some imaginary political figures and political events, so that we might present this as a story. However, the technical facts we use here represent the scientific and related facts of the Mars colonization plan as those facts exist today. The BBC television studio’s clock says that it is 1800 hours in London, on Wednesday, September 3, 2036 A.D. From 55 million miles away, on Mars, a televised image travels nearly 5 minutes across space, to be picked up by the giant geostationary receiver hovering over the South Atlantic, from where the signal is relayed to other satellites, reaching waiting disk-antennas around the world. A woman’s face appears on the BBC screen. The woman on the screen is in her late thirties. The sight of her familiar features brings expressions of admiration to the viewing audiences now receiving this live broadcast around most of the world. She is Dr. Ellen Jones, chief executive of the Mars colony, and the daughter of the famous space pioneer, Dr. Walter Jones, who headed the U.S.A.’s Mars-colonization program from 2008 until his retirement in 2027. The TV audience followed her 5-minute televised report with a scientific interest which would have been unimaginable when the Mars-colonization mission was first launched by the U.S., back in March 1989. The 1990s flights of transatmospheric craft up to stations in low-Earth orbit, had revived the spirit of the popularity of space-exploration from the Apollo-project period of the 1960s. After Earth’s first geostationary space-terminal had been completed near the end of the 1990s, manned flights to the Moon had soon become routine. 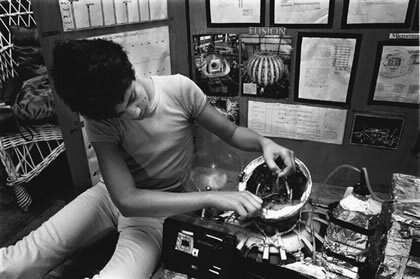 Over the 1990s, the point was reached that every schoolchild, not only in the U.S., Europe, and Japan, but throughout the world, demanded to know everything possible about space. 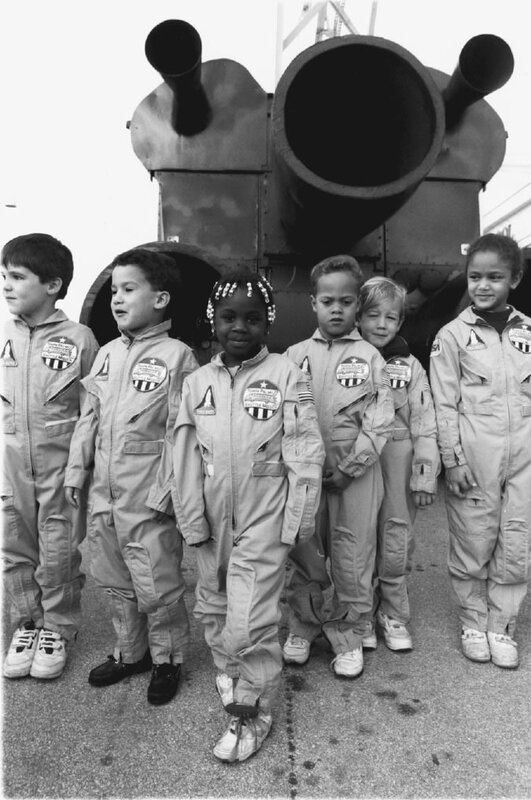 Schoolchildren in Tampa, Fla. outfitted for a mission on their “Space Shuttle” bus, which is designed inside like a Shuttle orbiter. Beginning the 1990s, fewer and fewer university students attended courses in the social sciences, as the physical sciences, including space biology, took over the classrooms almost completely. Even at preschool ages, more and more children, asked what gift they wished for Christmas, would answer, “a telescope.” As the industrialization of the Moon began near the end of the 21st century’s first decade, to look up was to express optimism about the human race’s future. Space and the spirit of adventure became one and the same. There had been a deeper quality of changes in attitudes. What had been the most popular competitive sports of the 20th century became less popular, and achievement in swimming, track and field, and mountain-climbing, the most popular features of physical education programs. “Keeping in shape for space travel,” was the value which more and more attached to physical education. Twentieth-century man would be astonished to know the new way in which “spirit of adventure” was translated during the early decades of the 21st. Some things 20th-century man would have recognized. Being the first to set foot on some planetary body, was of course a commonplace fantasy among children and youth. The difference was, most teenagers, and some much younger, already knew the real purpose of space exploration. That purpose was, to acquire knowledge which the human race needed, and could not gain without scientific exploration of our universe in a way which could not be done without traveling far beyond Earth’s orbit. The idea of adventure, was not a matter of simply getting to some strange place out there. Exciting adventure, was to participate in making some exciting new discovery in space, which would be useful to the majority of the human race remaining back here on Earth. So, those children and youth gobbled up every bit of information they could, with the purpose being to understand what kind of knowledge mankind was seeking out there. 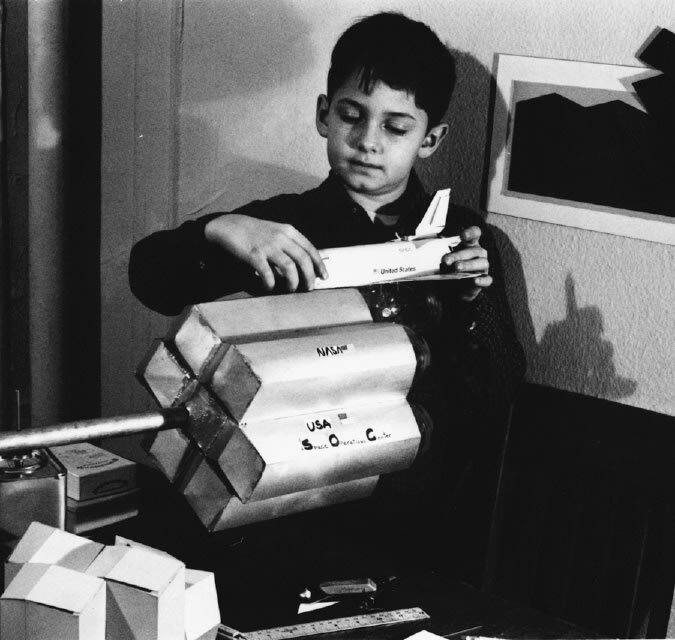 Children spent their time building models of everything to do with space—from spacecraft (below) to fusion power plants (above). The last two years, 2025-2026, just before the building of the first permanent colony on Mars, had seen the most rapid transformation in popular values here on Earth. The TV screens had been filled often with images of those giant spacecraft, each much larger than a 20th century ocean liner, taking off from the vicinity of Earth’s geostationary space-terminal, in flotillas of five or more, each seeming to thunder silently in the near-vacuum under 1-gravity acceleration. By then, a permanent space-terminal was being constantly manned in Mars orbit. The televised broadcasts from that terminal showed the monstrous spacecraft arriving. Earth’s television screens showed the gradual accumulation of that vast amount of material in Mars orbit, waiting for the day it would descend to Mars’s surface. TV viewers on Earth saw the first craft, designed to descend and rise through the thin atmosphere of Mars, and saw views of the approaching Mars surface from the cockpit, through the eyes of the cameras. A great anticipation built up throughout Earth’s population during those last two preparatory years. Then, Earth went through what was afterward described as the “sleepless year,” as the first city was assembled on Mars, during 2027. Audiences on Earth demanded to see every step of the construction relayed back here. Nearly everyone on Earth became thus a “sidewalk superintendent” for as many available hours as his or her sleep-starved eyes could be kept open. On waking, it was the same. The daily successes reported from Mars were discussed as widely and in as much detail as 20th century sports fans debated the details of a weekend’s football play. Astronauts are collecting Mars samples and conducting scientific observations, while a dust storm is approaching the cratered area near the landing site. In the background is Olympus Mons. By then, holographic projections had become as economical and commonplace as personal computers had been during the 1980s. Building a synthetic holographic model of the solar system, and constructing a powered-flight trajectory, such as one between Earth and Mars, became quite literally child’s play. A child’s parent could purchase a packaged program at a local store, and the child often insisted that this be done. Turning on one’s system, and updating the positions of the planets and the course of a space-flotilla flight in progress, became a habit with many. The same was done with various stages of the construction of the first permanent colony. Whatever was seen on the TV screen, was something one wished to reconstruct. The passive TV watching of the 20th century had come to an end. The first large-aperture radiotelescopes had been constructed a million or so miles from Mars, as soon as the manned orbiting space-terminal had been completed. The system of observatories and space-laboratories associated with them, was expanded rapidly, once the first 100,000 permanent colonists had begun to settle in. Popular fascination here on Earth, shifted its focus somewhat from the Mars colony itself, to these new projects. It was such a worldwide audience which sat or stood, absorbed with every sentence of Dr. Jones’s 5-minute report, either as it was being broadcast, or when morning reached them a few hours later. Throughout the planet, over the course of that Wednesday and Thursday, there was the eerily joyful sense that humanity had reached a major milestone in the existence of our species. It would be said, in later decades, that on that day in 2036, the Age of Reason had truly begun. At the beginning of the 1950s, space pioneers such as Wernher von Braun had begun working out the specifications for manned flights to Mars. 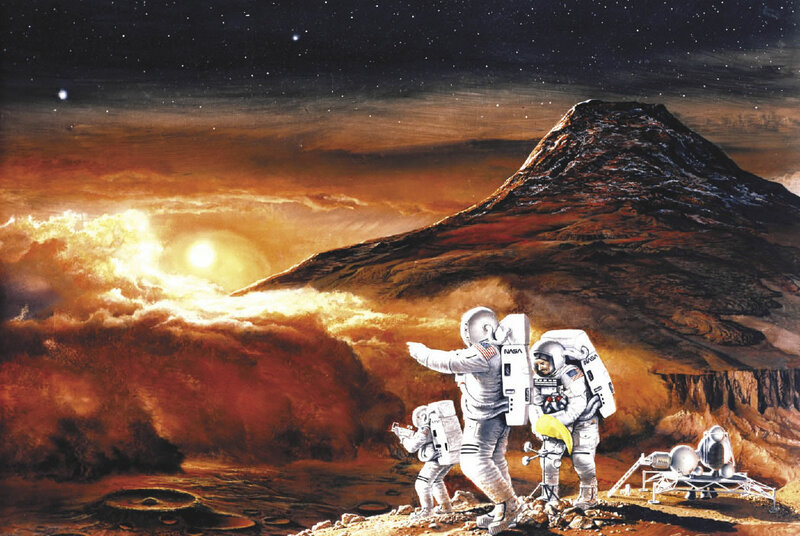 One leading Peenemünde veteran, Krafft Ehricke, had been certain that the United States could have sent a manned exploratory flight to Mars as early as the 1980s. Unfortunately, near the end of 1966, the United States had cut back massively on its aerospace programs. Presidents Johnson and Nixon did not eliminate President Kennedy’s popular commitment to a manned landing on the Moon from the NASA program, but most of the other aerospace projects, such as nuclear-powered propulsion development, were cut back, and cut back savagely as soon as the program of initial Moon landings had been completed. Krafft Ehricke continued toward his completion of the design for industrialization of the Moon, but he died in 1984, his work nearly completed on paper, with no visible prospect that the U.S. would resume such a commitment during the foreseeable future. It was not until shortly after Ehricke’s death that a renewed U.S. commitment to colonization of Mars appeared. 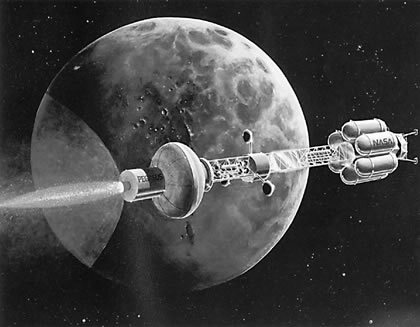 The proposal for a permanent colony on Mars as early as the middle 2020s, was a featured presentation at a Virginia conference held in honor of Krafft’s memory, in June 1985. Nearly a year after that, the National Commission on Space adopted the same target date, and its proposal was endorsed, although without significant funding, by President Ronald Reagan. However, the Mars colonization project was a featured part of the January 1989 State of the Union address of the new President. During March of 1989 a U.S. Moon-Mars Colonization Commission was established. During that month, the Congress rushed through approval of treaty agreements which the President negotiated with Japan and Western European governments, establishing these allies as partners in the U.S.-sponsored Moon-Mars Colonization Project, following on similar international agreements which had led to the construction of the space stations of the 1990s. Popular enthusiasm for the project was so great, that the President was able to secure a $5 billion initial budgetary allotment for the new project. Japan matched this with a sizably increased allotment to its own aerospace program shortly after that. Confident that changes in U.S. policies were going to bring the world out of what threatened to become a major depression, Western European governments came close, in total, to matching Japan’s budgetary allotment. The successive phases of the Moon-Mars colonization project were agreed upon that same year. It was quickly understood, that planting a permanent colony on Mars is a far different sort of undertaking than sending a manned exploratory vessel to visit Mars. Leaders recognized, that to establish a colony of even a few hundred members of scientific parties on Mars would require a very large complex of production workers, agriculturalists, and so forth. Back at the end of the 1980s, most citizens and politicians did not yet understand the significance of the fact that Mars is an average 55 million miles distance from Earth during the period one might ordinarily think of making such a flight. To sustain just a few hundreds persons there, was, by late 20th-century standards, a tremendous number of ton-miles of freight to be shipped from Earth annually. The scientists understood this immediately, of course, but it required a lot of effort to make this clear to most of the politicians, and to popular opinion. The scientists realized very soon, that we should plan to put not just hundreds of scientists, engineers, and technicians, on Mars. The purpose for going to Mars in the first place was scientific investigations. The main purpose was to build a system of enormous radio telescopes in the region of space near Mars, and to conduct the construction, maintenance, and improvements of these observatories from bases both in Mars orbit and on the surface of the planet. Using U.S. experience in demonstration tests of trained human individuals’ efficiency working in low-gravity Earth-orbit gained from the 1980s Space Shuttle and the 1990s space stations, it was estimated, that to construct as many observatories as Earth would need to explore the universe in as fine detail as must be done from Mars orbit, would require hundreds of thousands of man-hours each year. This figure included estimates on the number of days a year a human being could safely work in a very low-gravity field. The scientists estimated, that the cost of keeping a research worker alive on Mars adds up to a total amount of equipment more than 10 times that required to sustain a scientist in the middle of the Sahara or Antarctica. This did not include the estimated costs of transporting all that tonnage from Earth to Mars. The scientists explained to the politicians, “Mars is a very cold place by Earth standards, with a very thin atmosphere, a shortage of known water-supplies, and a lower gravity than Earth. People living on Mars must live in man-made environments under protective domes. The costs of maintaining those domes, of maintaining water supplies, of maintaining the atmosphere, and maintaining an acceptable temperature within the artificial climate, are enormous by Earth standards.” The biggest factor of cost those scientists had to consider was the cost of energy; they estimated that more than 10 times the amount of energy must be available, per person, on Mars, than the energy directly consumed by research teams in the Sahara or Antartica. They decided that the basic source of energy used on Mars would have to be thermonuclear fusion, as it already was on the Moon. 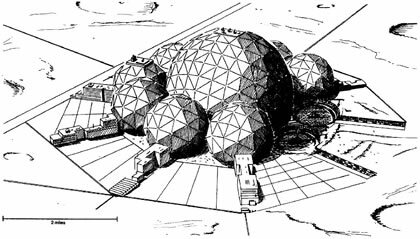 They pointed out, that the Mars colony would need very concentrated sources of industrial energy, to enable the colony to produce food and to sustain itself with the largest part of its requirements in materials. One early design for a space nuclear power system that would provide sufficient power for Earth-orbiting spacecraft, a lunar colony, or a piloted Mars mission. So, it was agreed that the way to sustain our teams of research workers on Mars, was to build a local supporting economy on Mars. They estimated that between a quarter and a half million total population would be the minimum size for a successful colony. They thought that this might be sufficient, if we gave Mars the new generation of industrial technologies which were in the initial development stages on Earth back during the 1980s. They saw, that to get that number of people to Mars, together with all that was needed to start up a colony of this size, was plainly impossible using the methods worked out for sending a manned exploratory flight to Mars. To lift that amount of weight from Earth’s surface, up into high-Earth-orbit, by conventional rocket methods in use in the 1980s, was beyond possible limits of cost. Even if the cost were greatly reduced by improved methods of liftoff, the amount of weight which would have to be lifted to deliver the requirements of a quarter to half a million Mars colonists from Earth, was still so costly as to be out of the question. The politicians had imagined, wrongly, that starting a colony on Mars was like establishing a research base-station in the Antarctic. The politicians imagined, that the technologies developed for sending a manned team of explorers could be expanded to transport a much larger number of colonists. The scientists had to make clear why this idea was badly mistaken. First of all, human bodies are designed to function under one Earth gravity, or at least something near to that. The human body might be able to adapt to gravities a large fraction of those on Earth, but long flights at nearly zero-gravity are very risky, and were thought to be quite possibly fatal. So, the idea of sending people to Mars in the way we sent astronauts to the Moon, was ruled out. The best way they knew to create the effect of one Earth gravity in spacecraft was to have that spacecraft constantly powered by one Earth gravity’s worth of acceleration, or at least a large fraction of one Earth gravity, creating an effect very much like the way a person’s weight increases when being accelerated upward in a 20th century elevator. The scientists pointed out, that powered flight at one-Earth-gravity acceleration, made possible new kinds of trajectory-paths between Mars and Earth, and reduced the travel time enormously. Some pointed out that this might be possible with ion engines powered by fission reactors. It was agreed that thermonuclear fusion would be far superior in several ways. They explained that fusion energy was the form of energy production which would be needed on Mars, in any case, and that fission-powered ion engines would still take too long to make the trip to Mars. The problem they tackled was convincing the politicians that the needed development of fusion energy had to be completed before the Mars trips began. It was decided, at the beginning, that the main part of solving the problem of lifting weight into geostationary Earth orbit from Earth’s surface, would be industrializing the Moon. Provided fusion power could be established on the Moon, they guessed that more than 90 percent of the total weight of large space-vessels, could be produced on the Moon, and lifted into Moon orbit at a small fraction of the cost of producing these materials on Earth. The same thing would apply to most of the materials sent to Mars to construct the first stages of a permanent colony. Space vessels to Mars, could be assembled in either Moon-orbit or Earth-orbit, and launched from either place. The scientists decided, that using a rocket to get beyond the Earth’s atmosphere is like designing an aircraft to fly under water. The idea of using a transatmospheric aircraft to get above the atmosphere, had been under discussion for decades, and preliminary designs were fairly well advanced during the course of the 1980s. It was decided to push the development of transatmospheric craft, to build up a network of low-orbiting space-terminals. This would provide the cheapest possible way of moving large numbers of people, and large amounts of freight, up beyond the atmosphere. It would also be the cheapest and safest way to bring people down from orbit to airports on the Earth. By that time, there were already designs for what were then called “space ferries.” These “space ferries” would carry people and materials over the distance from the low-orbiting terminals, to the locations of the main space terminals, in Earth’s geostationary orbit. These geostationary terminals became the locations at which technicians assembled the craft used for regular travel between Earth and Moon. 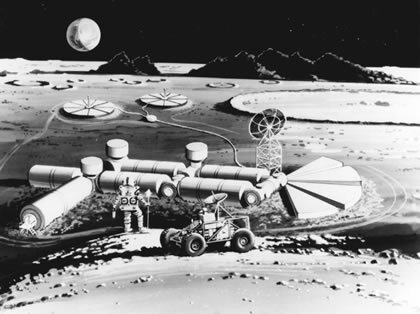 Lunar industrialization was necessary to produce and send materials to Mars, for its first permanent colony. 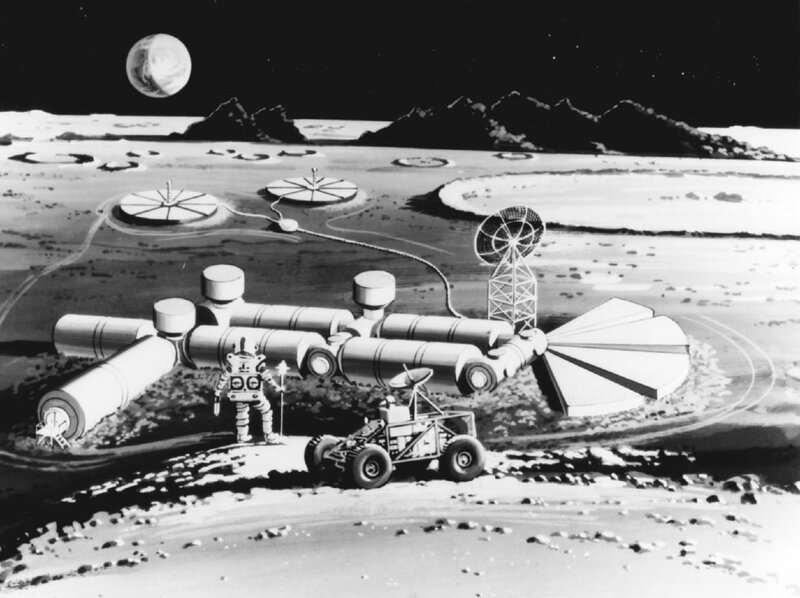 Here, a lunar resource processing plant, with two space nuclear power units in the background. So, on August **, 2000, the first routine travel between Earth and the Moon was begun. Some of the astronauts grumbled, complaining that they had become high-paid airline pilots. It was pretty much routine. It was policy, that the pilot made only a few round-trips between the Moon and Earth-orbit, before being sent back to Earth for rest and rehabilitation, although the main Earth space terminals already had a one-Earth-gravity artificial environment at that time. After a few trips, the space-pilots would board a regular bus-run of the space ferry at the space-station, get off at a low-orbiting terminal, and catch the next transatmospheric flight back to Earth. Few people living in 2036 remember this obscure event, but back in 1986, the United States sent two pilots to prove that a propeller aircraft could make a nonstop trip around the world. Most scientists thought the trip was a silly way to waste money for no useful purpose. The only reason one would mention that obscure flight in 2036, would be to show the kinds of problems the scientists faced in explaining space-colonization to the politicians and voters. Imagine a propeller aircraft, the combined weight of whose engines, fuselage, and pilots are nearly zero. In other words, how far can a pound of gasoline fly itself, given the efficiencies of propeller aircraft? So, this obscure flight was designed, making the weights of engines, fuselage, and pilots, as small a percentage of the weight of the plane’s maximum fuel load as possible. What did the flight prove? Nothing that a qualified aeronautics engineer could not have proven with an electronic hand calculator. The problem, back in 1989, was to explain to the politicians and public how this same problem, of total weight to fuel weight, limited the possibilities for getting into space, and affected the costs of getting a pound of weight into space. As everyone knows today, the farther a vessel moves from a planet’s strongest gravitational pull, the less fuel it costs to accelerate a pound of weight. The politicians got the point. The system of getting into space, from the Earth’s surface to the geostationary space terminal, and to the Moon’s orbit, was a kind of pyramid. The distance from Earth’s geostationary terminal to Moon-orbit, was the tip of the pyramid. The transatmosopheric system, between the Earth’s surface and the low-orbiting terminals, was the broadest strip of the pyramid. The space ferries, moving back and forth between the low-orbiting terminals and the geostationary terminal, were the middle section of the pyramid. One of the biggest obstacles the space program had to overcome, was the massive prejudice most of the politicians and public had built up against nuclear fission over nearly 20 years, between 1970 and the time the project began, in 1989. The political factor, of fear of nuclear radiation, was far more important than the engineering problems involved in using nuclear fission safely as a power source for aircraft and space vehicles. This prejudice was a major engineering difficulty, since nuclear fission gives much more power per unit of weight than chemical fuels. In all travel, the ratio of total weight to weight of the maximum fuel load, is the most important of the economic limits to be faced. However, by that time, thermonuclear fusion as a power source was nearly a reality. Fusion is vastly more efficient as a fuel user, than nuclear fission. So, nuclear fission was the power source for regular flights between Earth-orbit and Moon-orbit during those early years after 2000, but its uses for other modes of flight was avoided. To get from Earth-Moon to Mars, required us to develop another pyramid, with the base of the pyramid running from Earth’s geostationary orbit to the Moon’s production facilities, the tip of the pyramid reaching Mars surface, and the distance between the base-line and Mars-orbit the lower portion of the pyramid’s volume. A third pyramid was designed. The base of this pyramid was on Mars’s surface. Just as on Earth, we must move passengers and some freight from Mars’s surface into Mars-orbit. From there, in Mars-orbit, the pyramid branches in two directions. One direction leads back to Earth-orbit. The other direction was powered travel, as from Earth-orbit to Moon-orbit, to and from the radio telescopes and space laboratories constructed in the general vicinity of Mars. Those three pyramids became the fundamental design of the system of transportation as a whole. Once the first of the two pyramids had been designed, the key bottleneck next to be mastered, was production on the Moon. 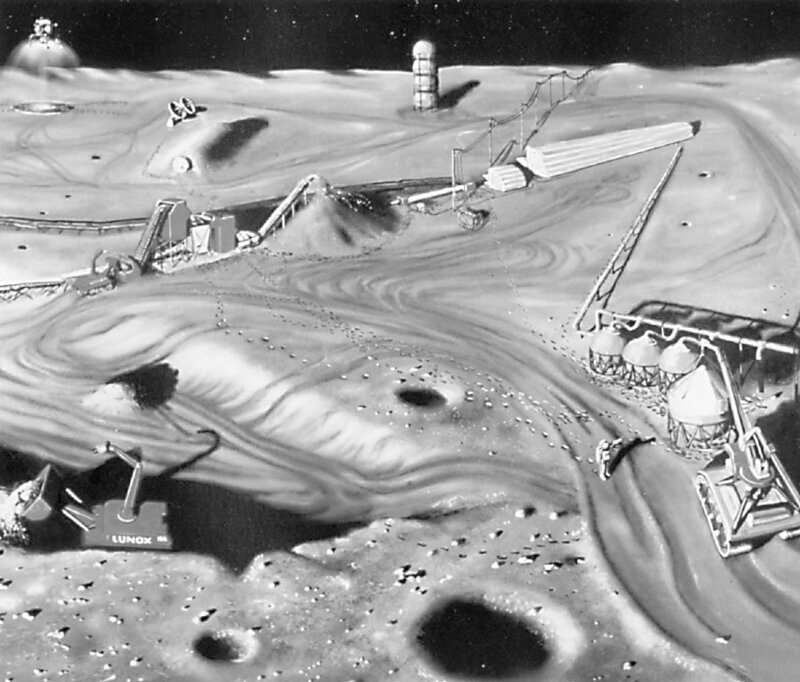 Quite clearly, the scientists could not think of building a 19th-century-style metals industry on the Moon. The combustion of oxygen, which had been the basis for metalworking on Earth deep into the 20th century, was not a workable proposition on the Moon, even if a combustible fuel could be found. Only three sources of industrial energy could be found. Electricity could be generated in various ways, or nuclear fission or thermonuclear fusion could be used. Just past the turn of the century, the fusionable isotope, helium-3 was being mined on the Moon. There are about 1 million tons of helium-3—a rare isotope of helium, which can be used as fusion fuel—trapped on and near the surface of the Moon. This Lunar Mark-II is a mobile robotic miner designed to process the soil, extract the helium, redeposit the processed soil, and move on. The University of Wisconsin device has a soil processing rate of 556 tons per hour. Krafft Ehricke had worked out a nuclear-fission economy for the Moon, but it was realized that a thermonuclear-fusion economy would be far better. For the rest, the standard handbooks of physics and chemistry already existing in the 1980s were most helpful. The policy decided upon was this. As every schoolchild knows his ABCs in 2036, production of inorganic materials is a matter of what most back in the 1980s still referred to as the available temperatures of production processes. If the highest industrial temperatures then in general use, could be increased by an absolute factor of slightly less than 10 times existing modes, there was no material in the solar system which cannot be reduced to a plasma form under such conditions. Back in the 1980s, we had only two ways in sight for doing this efficiently, thermonuclear fusion and coherent electromagnetic pulses of high frequency, and very high energy-density cross-section of impact upon targeted materials. The problem which the project’s leaders faced then, was that if we reduce material to its plasma state, how do we handle it? The answer is familiar to every schoolchild in 2036, but it was a major problem for the scientists back in 1989. The key to the solution was obviously lessons learned in experimental efforts to develop thermonuclear fusion as a source of power. It was clear from the beginning of the project, that if the schedules set for Mars colonization were to be realized, it was indispensable to accelerate thermonuclear fusion development and development of techniques associated with high-frequency lasers and particle beams. The development of the gamma-ray laser was given much higher priority through these decisions. The decision was made, to achieve what were called then “second generation” thermonuclear fusion technologies by the middle of the 21st- century’s first decade, and to put accelerated efforts behind mastery of techniques for production of materials using electromagnetically confined plasmas. One of the new plasma applications is magnetoplasmadynamic thrusters for use in cargo vehicle propulsion. This artist’s drawing shows a high performance electric propulsion cargo vehicle approaching Mars. The fact that we were obliged to force the development of advanced technologies then on the horizon, in order that we might solve the materials-production problems we faced on the Moon, greatly accelerated our civilization’s development of newer types of ceramics. We did not have the development of ceramic materials of anomalous crystalline structures on the list of project requirements at the start, but once we recognized the advantages of materials so novel to us at that time, we added the forced development of these technologies to our project. In the same way, we were forced to develop the early varieties of laser machine-tools in general use in 2036, to be able to machine these new materials. Our project brought the techniques of electromagnetic isotope separation up to a level of refinement still considered modern today. It was the success of these breakthroughs in fusion, lasers, and very high energy-density production processes, which made the industrialization of the Moon such a brilliant success. It was by perfecting these methods and processes for the industrialization of the Moon that we solved in advance the major problems we would have otherwise faced during the initial colonization of Mars. The building up of the Moon’s industrialization was the major factor forcing us to delay the beginning of Mars colonization until 2027. Had we not developed the technologies needed for industrialization of the Moon, as we did, the colonization of Mars would have been delayed by a decade or more. 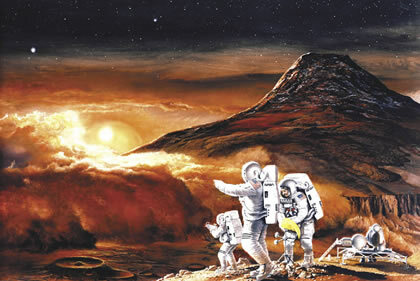 Some of the 1985-1986 plans included a heavy emphasis on new directions in biology, but without the desperate fight Earth had to mobilize against the AIDS pandemic, it is doubtful that many supporters of our Mars colonization project would have been won over to supporting this line of research to the degree which later proved necessary, once the Mars colonization had begun. So, today, we are able to incorporate the benefits of this research into designs of systems for manned deep-space explorations, and have overcome most of the fears of possible strange diseases which might be encountered, or might develop, in our further explorations and colonizations of space. It was not until the late 1990s, that the last significant political opposition to the costliness of the Mars-colonization project was overcome. The process of lunar industrialization prepared the way for colonizing Mars. 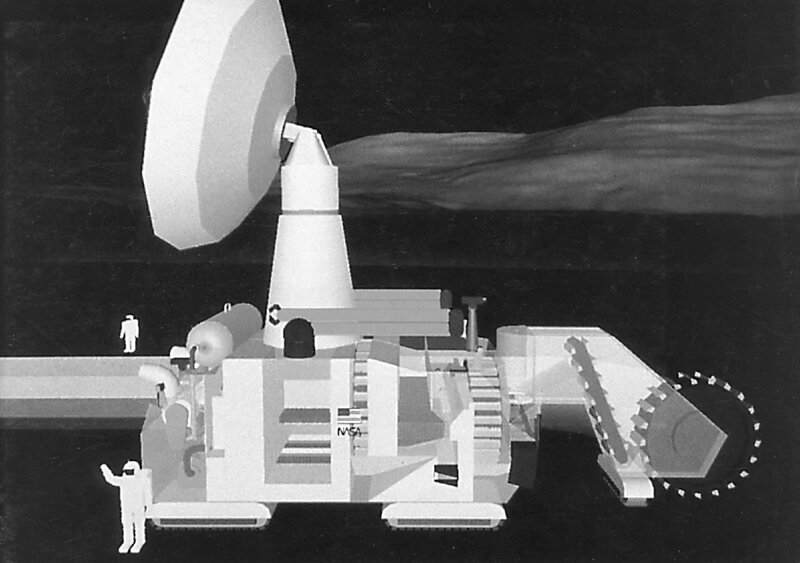 Here, a lunar resource processing pilot plant, designed to develop the technologies used for collection, analysis, and both mechanical and electrochemical separation of lunar surface resources; for production of materials needed for life support and propulsion (such as oxygen); and fabrication and construction of structural elements. We began the project in 1989, under what might seem to have been the worst economic conditions for such an undertaking. Over the preceding 25 years, most of the world had been caught in a long process of economic decline, which we described then as a drift into a “postindustrial society.” In many of the then-industrialized nations, the average income of households had fallen to about 70 percent of the real purchasing power of 1966 and 1967. Entire industries which had existed during the 1960s, had either been wiped out, or nearly so, in many of these nations. The basic economic infrastructure, such things as water management and sanitation systems, general transportation of freight, energy systems, and educational and health care systems, were in a state of advanced decay. To cover over the collapse of incomes, a massive spiral of borrowing had occurred in all sectors of government, production, and households; a terrible financial crisis had built up. Those who pushed the Mars colonization project the most, including the President of the United States, did not view the project as a way of spending a large surplus of wealth. It was seen by them as a way of helping to revive a decaying economy, and also a way of showing all mankind that our species has meaningful opportunities for present and future generations, opportunities as limitless as the universe itself. 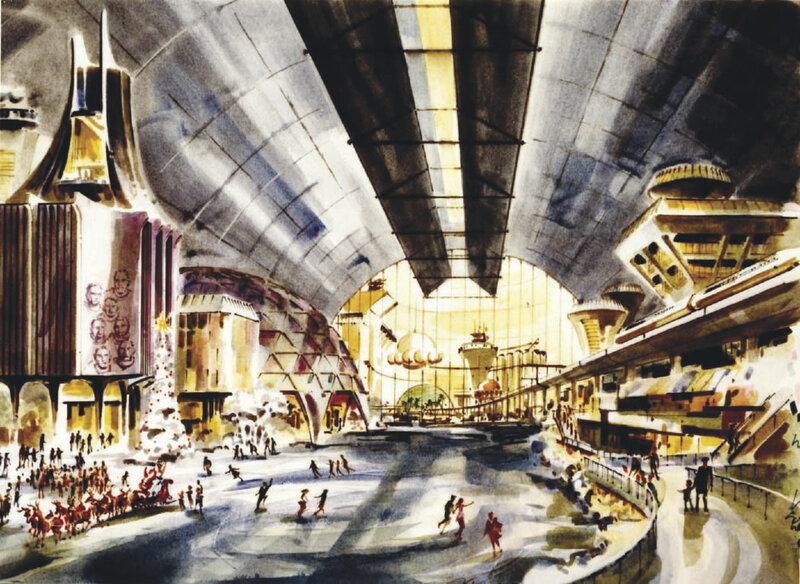 Christmas 2031 in Selenopolis—the Moon city envisioned by space scientist Krafft Ehricke. 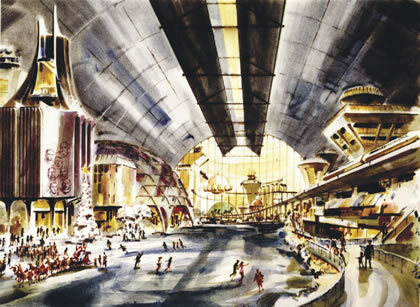 At left is the “Hall of the Astronauts.” At right, an elevated monorail train. Behind the transparent insulation is a nodal dome with supplies and life support and climatizing equipment. At the rear is a domed tropical habitat sector. At first, many grumbled political objections against the large sums of money spent. As the citizens saw new industries and employment opportunities opening up as a result of the Mars project, the political support for the project grew. Over the course of the first 10 years, the project grew in importance as a technological stimulant to the growth of economies. Then, the first decade of the 21st Century, there were waves of revolutionary improvements in methods of production; many of these benefits were the direct result of using the new space technologies in everyday production back on Earth. The political opposition to the project’s cost vanished. One of the first of the developing nations to join Japan, the U.S., and Western Europe, in the project, was India. The next were Argentina and Brazil. The project’s leaders and sponsors showed wisdom in encouraging participation in their own programs by young scientists from many nations. The fact that we may be so confident that general war has disappeared from Earth in 2036, can be credited to the Mars colonization project to a large degree. The rate of technological advancement and increase of wealth in the nations which undertook the project from the start, has been such that no potential adversary would think of attacking them. As it became clearer to everyone that there were going to be large permanent colonies in Mars during the middle of the 21st century, the general idea of developing the worst deserts of Earth worked its way into policies of governments. Africa, whose population-level collapsed by more than 100 million during the course of the AIDS pandemic, is growing again, and not only the Sahel region, but large stretches of the Sahara are blooming areas with new, modern cities. Kepleropolis, the first Mars colony, is depicted here in the construction phase. Its main dome, 1 mile in diameter, is built in a crater. Surrounding the main dome are 10 smaller domes, each able to support neighborhoods of 50,000 individuals. The ecliptic of the dome is at ground level. On the surface level is a large educational and recreational park. Immediately below are administrative offices, and on levels below that are transporation and storage facilities and a central fusion power plant. An astronomical observatory and communications station is on top of the main dome. No one talks of overpopulation any more. The idea of transforming the Earth-sized moon of Saturn, Titan, into a new colony, beginning 40 to 50 years from now, is already more popular than the colonization of Mars was, back during the late 1980s. Titan’s atmosphere is poisonous, but we can foresee ourselves gaining the kinds of technologies needed to Earth-form a planetary body of that sort. The strongest voice for this is coming from the Mars colonists, who now say that they find everything delightful on Mars but its uncomfortably low gravity. There is also big pressure for such new major space projects from circles tied closely to the Moon industrialization program; they say that Moon industries are ripe for a major new challenge. The Mars colony will be almost self-sustaining within another 10 years. No one on Earth worries any more about Earth’s continued subsidy of the colony; who doubts today, that the economic benefits are already vastly greater than the amounts we have spent. There are now over 200 spacecraft traveling back and forth between the orbits of Earth and Mars, and with each journey, more going to Mars than returning. We expect the population to reach over a million within a few years. We wonder if more than a handful living back in the late 1980s dreamed how much their decisions would change not only the world, but the solar system, for the better, within two generations.